The year end is coming closer, and while the season of Christmas markets, parties and year-end reviews has also reached Walldorf, we have published the fourth release of the SAP Best Practices for SAP SuccessFactors Employee Central in 2018. One year ago, we started the journey of providing SAP Best Practices configuration automated, in an easy to use and very modular way via the SAP Upgrade Center. Today, the entire scope of EC is available via the SAP Upgrade Center (only exception: Integration EC with EC Payroll). We have even started adding other SAP SuccessFactors Best Practices such as Recruiting Management to the SAP Upgrade Center. Further packages will be made available in the coming year. With the SAP Upgrade Center, the deployment of SAP Best Practices changed fundamentally. This new activation approach was rolled out in several partner enablement sessions, it got explained in this blog and as part of the learning course “Configuration made simple for SAP SuccessFactors with SAP Best Practices” which was launched this summer on SAP Learning Hub. And of course, everything is documented nicely on SAP Best Practices Explorer as well. Not only the deployment has changed, we have also added and improved the scope of SAP Best Practices for EC. In a harmonization project with the Model Company for HR we took the opportunity to rethink and improve parts of the existing pre-configurations based on most recent insights out of real life implementation projects. As such we are using now the Event Derivation instead of the manual choice of Event Reasons, we have added a new workflow for One Time Payment Maintenance (this was originally called Spot Bonus), etc. For EC, the harmonization got successfully completed from a content point of view with 1811. The only remaining open item is the terminology alignment which is expected to come in 1902 (April 2019) and will finally complete the harmonization project. So, stay tuned! Besides harmonizing and improving the existing pre-configuration, we also looked into new functionality which was delivered for EC during the year to investigate for which new functionality to build SAP Best Practices for. In Time Off for instance, we added one global example for the recently introduced Time Collector functionality. As per this example an error message occurs in case you record more than 10 working hours per day and/ or in case you record more than 180 working hours per month. Once the respective Upgrade Center Item got activated, there is of course the possibility to adapt the threshold values afterwards. In the latest release, we enhanced the localized country versions for Mexico, Singapore and New Zealand. 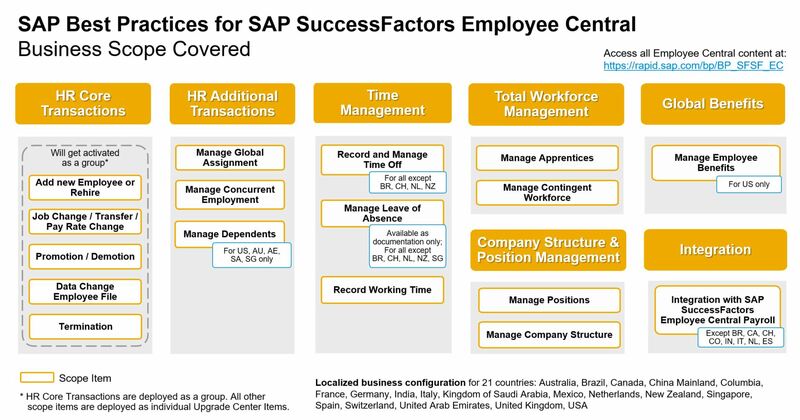 For all countries we added the Integration to SAP SuccessFactors Employee Central Payroll. For Singapore, we added in addition Dependents Management. The respective country-specific Upgrade Center Item brings the country-specific fields for Home Address and Global Information with one click into your system. Time Off got enhanced for Singapore, too. Here, we now deliver country specific Time Account Types with respective accruals for: (Extended) Child Care Leave, Sick Leave, Hospitalization Leave, Maternity Leave, etc. 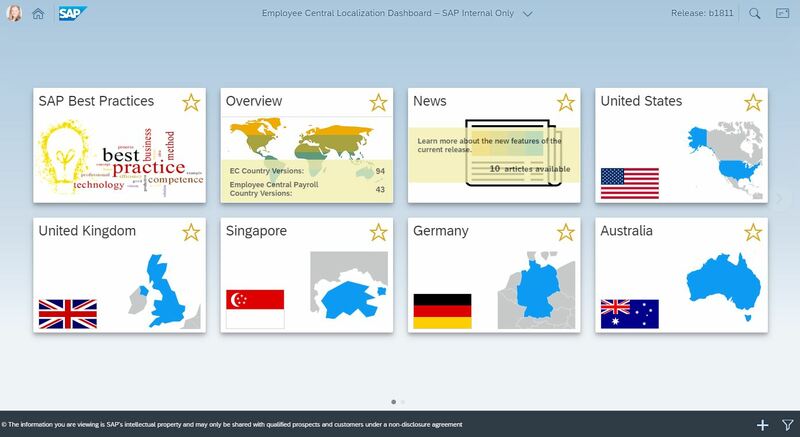 If you ever wonder for which countries SAP Best Practices exist, you can either check out the Employee Central Localization Dashboard (ECLD) or you directly visit SAP Best Practices Explorer, the central portal where all our documentation is published. That’s all for 2018. We hope you like the pre-configuration we built so far and are looking forward to building beautiful configuration next year! But before, we’ll take a little rest. Merry Christmas and a happy year end! Indeed. SAP Best Practices Explorer is the central entry point where you find all information which are needed for a successful SAP Best Practices implementation.